Only someone from up here would go to North Dakota for a weekend. Voluntarily. And did I ever luck out weather-wise. For a few hours on Saturday I had warm temps, blue sky and lovely sunshine. Just when I had to go get my husband from what he was doing, the clouds moved in and the wind picked up. The wind in ND is nothing to mess with. 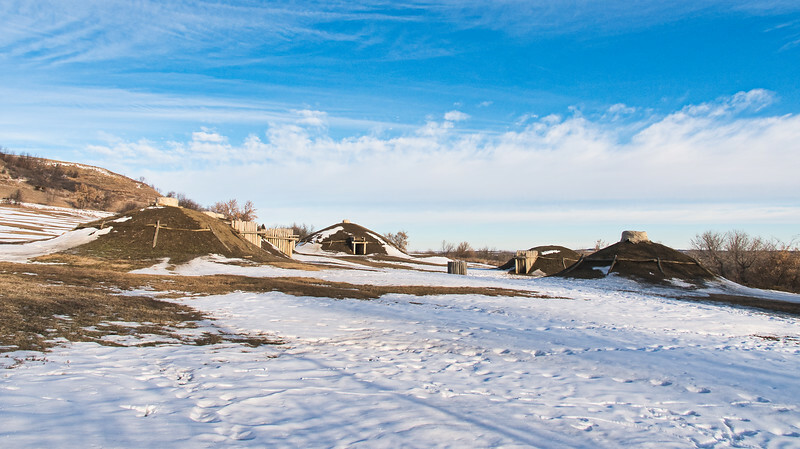 My first stop was to Fort Abraham Lincoln State Park and the On-a-slant Mandan Indian Village. It was a moving experience. Mainly it was that I was alone at this historic location and could absorb the atmosphere without disruption or distraction. 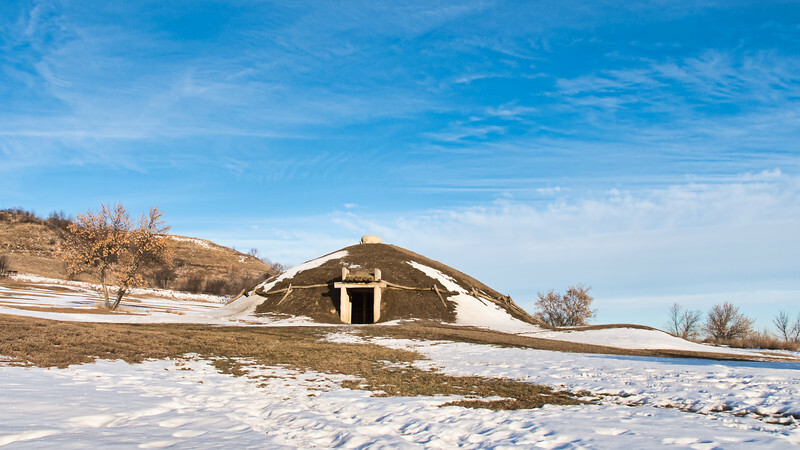 While the structures weren’t actually built long ago by the Mandan people, the site is original to them and had been used over and over for generations. 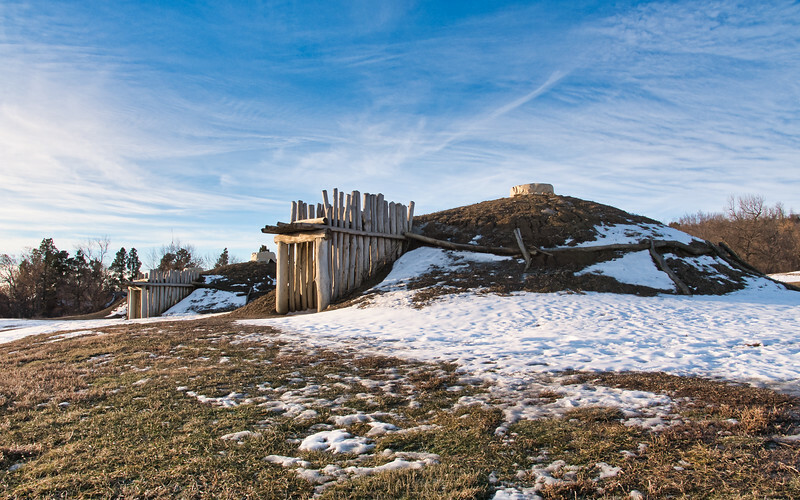 Unlike some other plains nations, the Mandan depended on farming for a large part of their daily diet. They grew a variety of crops including beans, squash, sunflowers, and tobacco, with corn being the main crop. 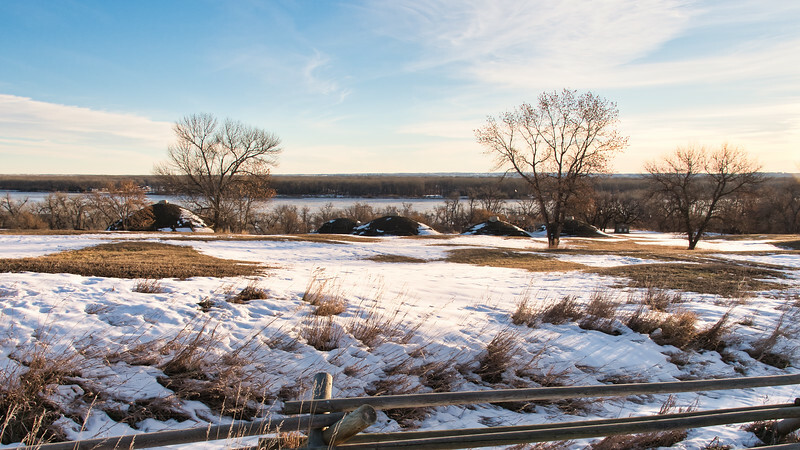 This village first came to outsider’s attention when William Clark, of the famous Lewis and Clark expedition, noticed the remains of buildings on the banks of the Missouri river where it meets the Heart river. 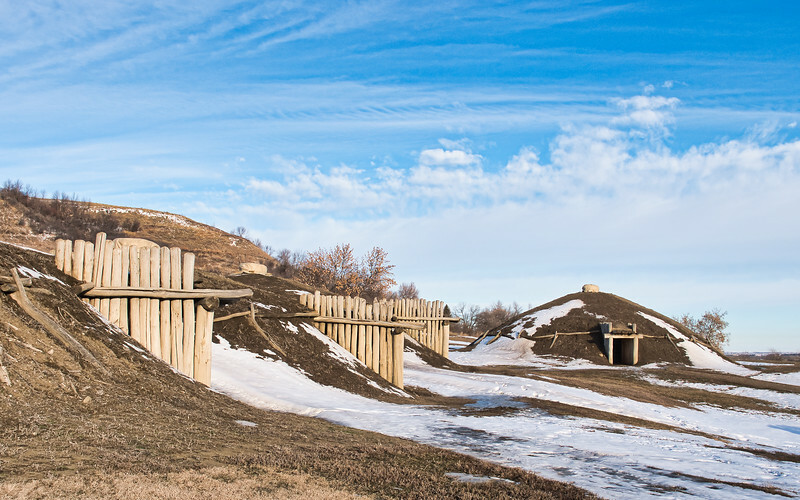 Later, a military fort was erected near the site in a fever of irony, avarice and hubris; the war against the Lakota Sioux and Cheyenne peoples. It was abandoned not long after and in the 1930s authorities finally surveyed the site and protected the remains of the riverside settlement. In the original language the village was called Miti-o-pa-resh (or possibly Miti-ba-wa-esh) which means ‘the slanting village’. Using tree ring data from wood found at the site, it was determined to have been established in 1575 and occupied for just over 200 years. It was one of nine similar villages in the area. 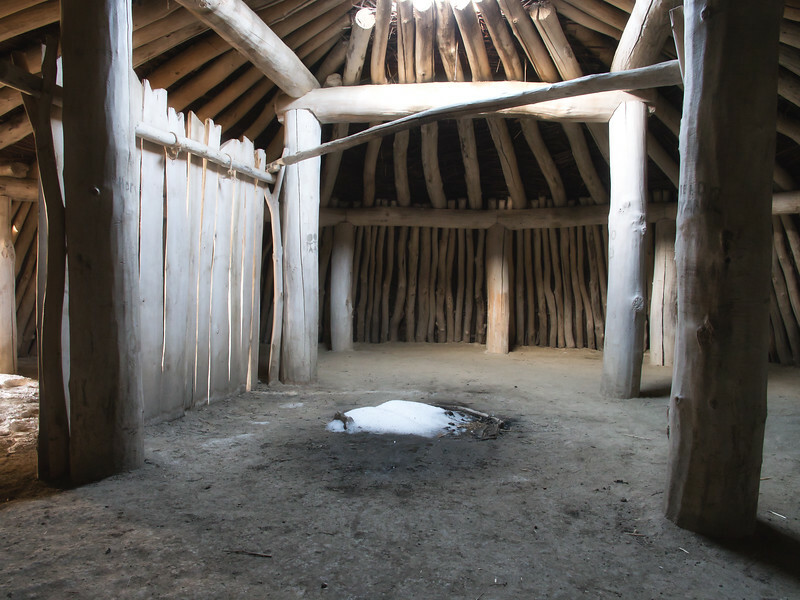 While there are only 5 reconstructed lodge homes at this site, there were probably close to 100 when fully occupied. With excellent fishing, hunting and farming, the villages soon became trade hubs along a large interconnected network of relationships with other villages and peoples. Traders started arriving in early June and stayed several weeks to complete their negotiations. The Mandan gained notoriety for their painted bison hide robes. I would so loved to have seen examples of their handiwork, but the visitors’ center was closed. Recreated in the 1930s by the Civilian Conservation Corps, there is a large communal building as well as family lodges that would house 10-15 people. This means Miti-o-pa-resh could have had 1000 people living here. 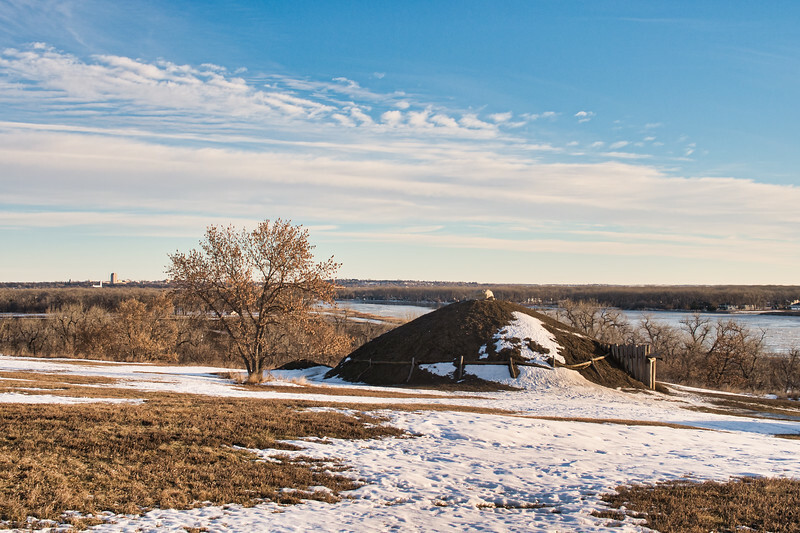 The authenticity of construction techniques was overseen by Scattered Corn, a Mandan woman who learned earth lodge building techniques when she was a girl. 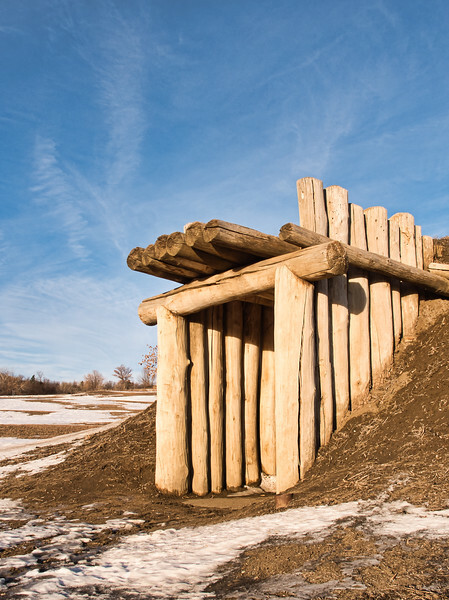 That is not unusual – Mandan women owned and built the lodges themselves. 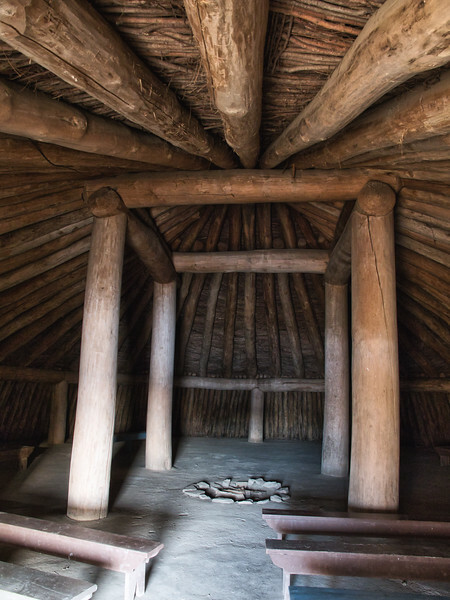 The main support timbers are cottonwood and the roof is made of woven willow branches and covered in earth and sod. 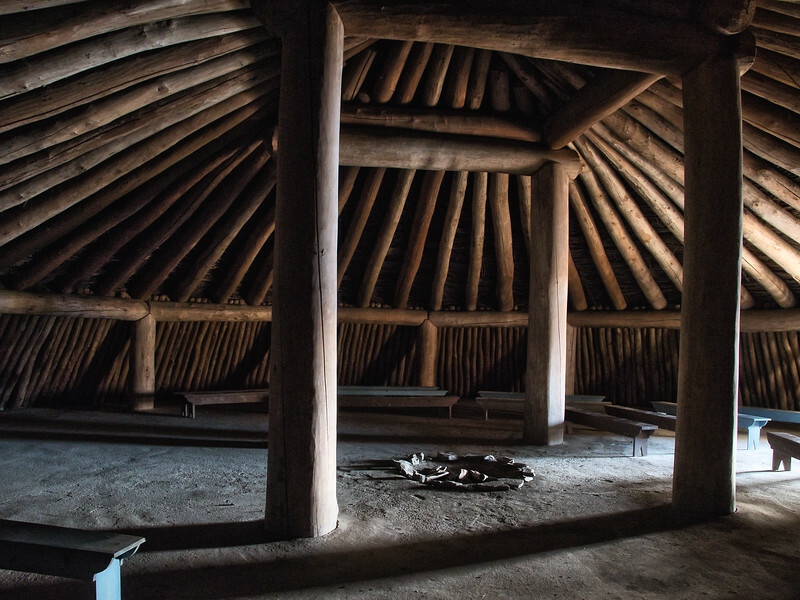 Smoke holes are in the center of each roof and the family lodges feature plank wind-breaks to shelter the the main room from the winds that howl down the river valley. The men hunted and went to war while the women did the farming, cured animal hides and preserved meat, gathered wild berries and other foods, wove baskets and made pottery. They probably took care of the children as well so the heaviest work burden was on the ladies. As usual. There is a new theory that sudden and increased warfare among native peoples was the result of women taking on farming duties and rising in status and importance. Like hipsters with beards today, the men back then had to find something to do that the women couldn’t and killing each other was it. When I visited only the great house and one of the smaller lodges was open, the others probably being shuttered for the winter. The dry moat has been re-built, but the wooden palisades weren’t up when I was there. During the regular season park employees are there to explain about the use and history of the settlement. I had to use the googles. It was a very humbling experience to visit this park. 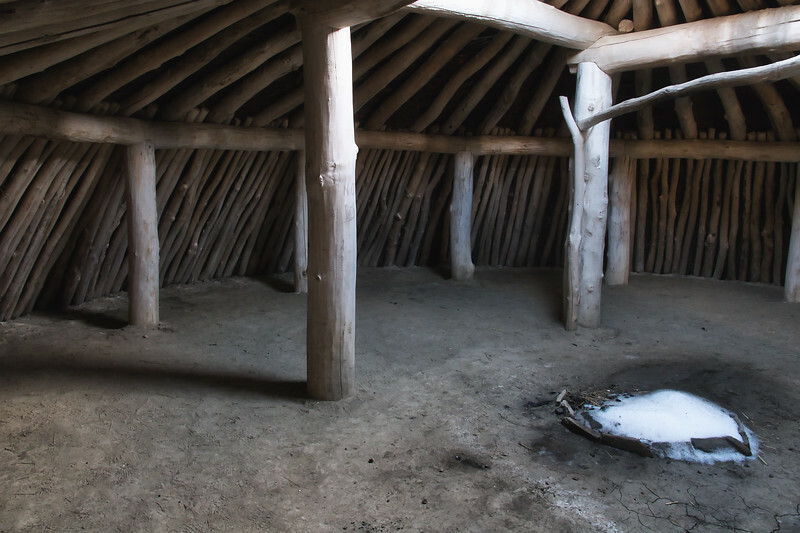 When inside the lodges I marveled at their construction and how warm, safe and connected to each other the people who lived here must have felt. Just imagine lovely rugs or fresh reeds on the floor. Cooking pots and baskets near the fire. Clothing and artwork. Children and dogs dashing in and out. Sleeping rolls tucked away, waiting for their owners to return. I feel especially sad that none of the native groups in North America had developed writing. Their history was passed down orally and when most of the people died from European-introduced diseases like measles and small pox, that history was lost. Just how much of the history and customs of your town would you know if you were the only one left? And then how much would you remember if it was illegal to practice any of those customs and traditions? It’s a loss of which we will never grasp the magnitude. But let’s not end on a very sad note. The Mandan village of Miti-o-pa-resh was such a delight that I just went on and on about it, didn’t I? The light was beautiful, the day was crisp and there was no one else around. Just how I like it. If you’d like more information on the Mandan, their customs and tribal affiliations, here’s a list! Another North Dakota post or two will be coming since I roamed the countryside a little and visited another tourist attraction.